The kitchen makeover has become a little bit more major, which pleases me immensely. When I sold the old kitchen table, and relocated the huge ikea unit to my studio, I inadvertently exposed the kitchen for what it was - a rather uninspiring, difficult space. It's essentially a galley kitchen, with french doors at one end, an annoyingly low window, and though it's big enough for a table, it's really only wide enough for said table to go against a wall. It has quite a low ceiling, and has been feeling really cluttered and neglected for some time. Storage was not abundant, and removing the Expedit unit has, umm, highlighted that fact, but it had to go as it had become a magnet for junk and looked so big and cumbersome. So, what to do? A lick of lovely pale grey paint has started to bring it back to life a bit, and whilst that's been happening, I've been plotting, scheming and planning and dreaming. And changing my mind. A lot. I've bought some ikea kitchen wall units which we're building an MDF frame around to strengthen. These four cupboards will not only help on the storage front, but double as a bench seat under the low window. I'll share details of that when it's all finished, but I'm super excited about this. The other major thing is that instead of just replacing the splashbacks, on one side we're going to tile the entire wall, which will bring the two ends of the room together. Moving the fridge to a corner has also helped as it felt almost like a room divider where it was before. It's not ideal to be honest, as it's now next to a radiator, but it just doesn't work anywhere else. Believe me, over the last six years, I've tried. 1. Cat paintings by Faye Moorhouse. I'm a bit in love with Faye's work since stumbling upon it recently on Instagram, and bought all four of these cat paintings, for ten pounds each from her Etsy shop. Yes, that's right, original paintings, for just ten pounds a pop. I can't wait to get my cats framed and up. My husband even likes them, and he hates cats. 2. Told you my Popsicle Pot would end up on the new kitchen table, didn't I? 3. Fantasy entry number one... My only hesitation with tiling the whole wall, is making the room feel cold. I think a brass sconce would look amazing hung on that wall above the table, and would totally solve that problem. I LOVE this beauty from onefortythree, however they're US based, so with having to change the socket, import duties and shipping, it'll start to add up, so I'm holding off for now, but it's very much on the wish-list. I'll see if they'll make it with an exposed cable and switch so that it wouldn't have to be hard-wired, because having to rip off tiles to hard-wire it at a later date is not an option. Duh, that would just be silly. 4. Ah, the tiles. I have to admit, I've changed my mind several times whilst writing this post. The ones I really really wanted are obscenely expensive. Then I found some that I loved on screen (yes, I'm a big online shopping fan), but the black just wasn't black enough in the flesh, so I quickly fell out of love with them. I went back to the drawing board for the umpteenth time, and came back to an old favourite - the hexagon. These ones are quite big - 17.5 x 20 cms per tile, so I think they'll look rather striking on the wall. We'll use black for the main wall, and possibly white on the other side. They're actually cheaper than any of the other options, at only £20 a metre, which I think is a bit of a bargain, and they won't compete with the fabric that will be used to cover the bench seat cushion. 5. Rubine Ashes is a new(ish) soft pale grey by Little Greene. It's slightly warmer than the grey I'm doing the top cupboards in (Urbane Grey, and the lower cupboards are Lamp Black - both also by Little Greene), and I like the way they sit next to each other. 6. Our new kitchen table is by a company called Unto This Last, in Brick Lane, close to where we live in London. I love that it's handmade by local craftsmen. 7. A bit of a treat is this lovely brass hexagon pot by Ferm Living. No doubt it will be a planter for one of my growing succulent collection, or perhaps a little fern. 8. I know it happens a LOT, but I am totally in love with this Tommy Bahama Swaying Palms fabric which is for our bench seat cushion. It can be used out doors too, so I'm hoping that will mean it will stand up to use in the kitchen, and life with a small boy and young lady. I'm going to have to try my hardest not to use it in every room of the house. 9. I'm trying to cram in as much storage as possible without it looking that way. This Grundtal shelf will go above the fridge to house large vases and appliances that we don't need to access every day. It won't look heavy and I can also hang a plant or two from it. Yay for hanging plants! 10. Annoyingly, several Ikea products that I'm desperate to get my hands on, aren't stocked at my local store, and aren't available online, so I'll be making a pilgrimage to another store soon, to buy a few of their great planters and baskets, like this Riskorn one. What's with that Ikea? Do you think that your Edmonton customers don't like green baskets? We do, we really do!!! 11. I really like the new Metod Ikea kitchen. These are the cupboards for the bench seat hack. I just want them to blend in as much as possible because it's all about that fabric! 12. 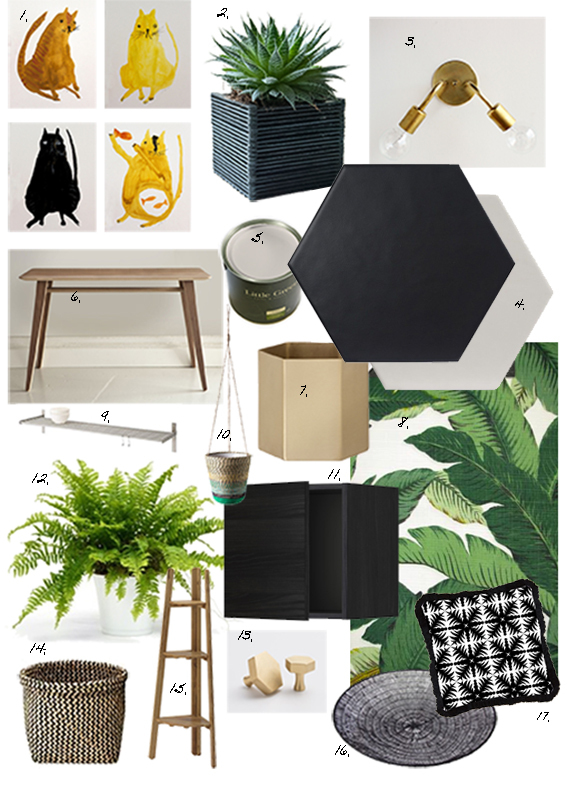 You've gotta love a Boston Fern, huh? 13. Fantasy entry number two... The lovely Kate over at Mad About The House, knows all about my cupboard knob woes. I desperately want these divine brass hexagon ones from Schoolhouse Electric, but shipping and customs charges, might not allow. 15. I'm aware that there are several Ikea products here, but they're in extra good form at the moment. This plant stand is only £15 pounds and will fit nicely next to the fridge to hold, um, a plant and maybe some pots. The ones that fall out on my feet when I open the cupboard. 16. I've been eyeing off this beautiful wire bowl by Pols Potten at Heals for months. It would look so lovely on the new table. Sadly it hasn't gone into their sale. Yet. 17. This is a very sneaky peak at one of the patterns from my upcoming cushion collection. It's called Coconut Palm, and a few of these will look just right against that gorgeous green fabric. We're several weeks off finishing this room, but I'm so excited. I spend lots of time in there, and this new design might just take it from being my least favourite room, to my absolute favourite. I can't wait to sit on the new bench seat in the sun, sipping an Iced Matcha Latte. Obviously I'll show you when it's all finished and looking pretty, so watch this space!